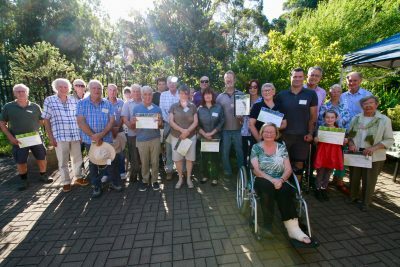 Some of Lake Macquarie’s hardest working volunteers have been given a green thumbs up at the Lake Macquarie Landcare Volunteer Network’s annual Landcare Awards. Volunteers from throughout the City came together on 30 November for the Lake Macquarie Environmental Excellence in Landcare Awards, which recognise the past 12 months of achievements. Lake Macquarie Landcare Coordinator Jason Harvey said Lake Macquarie’s 200-plus Landcare groups had cleared more than 163,000sqm of environmental weeds so far this year – the equivalent of about 22 football fields. “Our tireless volunteers have contributed more than 16,400 hours to regenerating natural areas of Lake Macquarie in 2018, which equates to about $450,000 worth of labour,” Mr Harvey said. The evening’s top gong – known as the Soaring With the Eagles award – went to Redhead Bluff Landcare group team leader Brian Hilton. The award is bestowed annually on a volunteer who has made a regionally significant contribution to the environment. “Brian is a champion of caring for the land and encouraging younger generations to follow in his footsteps,” Mr Harvey said. “His leadership, mentoring and campaigning have led to countless schools, community groups and local businesses contributing to the landmark Redhead Coastal Corridor Project. Mayor of Lake Macquarie, Cr Kay Fraser, said the growth of Landcare in Lake Macquarie demonstrated the close connection so many people in the community had with their local environment. “A total of 10 new Landcare groups have been formed in the past year alone,” Cr Fraser said.